This isn’t jewelry you put on and forget about. 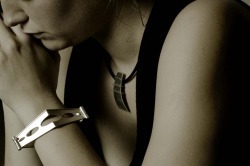 Heather’s Contemporary Art Jewelry is a showcase of exclusively designed jewelry that becomes apart of you, it effects your movement, how you view yourself and how you interact with those around you. This is very personal jewelry that you build a relationship with and won’t forget about it once it is on, like living with a painting in your home. Likewise at the end of the night you won’t hide these pieces away in a drawer, you will place them where you can admire and love them for the beautifully handmade objects they are.